You will be greeted at the pier and begin your tour to the Valley of the Kings by transferring to Luxor. The Valley of the Kings was begun during the 18th Dynasty when they abandoned Memphis. The tombs here are cut directly into the limestone, thus making it harder to rob the tombs. You will then visit the temple of Queen Hasheput, the first great female ruler. Upon the death of her husband, Pharaoh Thutmose II she proclaimed herself Pharaoh over his rightful heir, his son & her nephew. She dressed as a king, even wearing a false beard. Her reign lasted for 20 year. When the nephew grew to be a man, Hasheput disappeared from history. All that remains is the temple which Thutmose III removed her name & likeness from during his reign. Next stop to view the Colossi of Memnon, the two massive stone statues of Pharaoh Amenhotep III. Built from blocks of quartzite sandstone, each colossi reach a feet of approximate 60 feet. Their original function was to guard the entrance to Amenhotep's memorial temple. After transferring back to the eastern bank of the Nile, there will be a break for lunch. There will be an optional tour - sound and light and city tour. You will be transferred to your hotel of choice. After breakfast you will meet in the lobby to transfer to the great temples of Karnak. 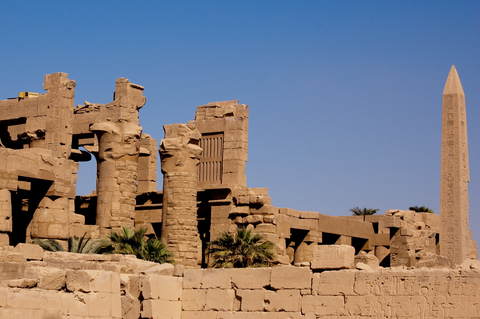 Karnak is likely the second most visited site in Egypt next to Giza. This vast complex was built and enlarged over a thirteen hundred year period. It is the largest temple complex ever built by man, and represents the combined achievement of many generations of ancient builders. The Temple of Luxor was the center of the most important festival in ancient Egypt. This is the location of the Festival of Opet, where the king become rejoined with his ka and thus being transformed into a divine being. After taking a break for lunch, you will then begin your journey back to your cruise ship. Remember to bring your camera. Hotel choice includes accommodations at either Sheraton Luxor Resort or Sonesta St. George Hotel.